An Interview with Matthew Pinsker. · One Book. One Author. One Hour. 1:32 – How did your book come to be on Booknotes? – It is a little bit of a mystery. Books about Lincoln are usually popular on programs like this. But this was only his second book so it was not a guarantee that it would get this kind of attention. Pinsker thinks that the National Trust for Historic Preservation, which funded the book, may have lobbied Brian Lamb for a place on the show. 2:15 – How did you prepare for your appearance on Booknotes? – He first made sure he asked his wife what to wear, tried on many ties, and made sure he was property groomed. He also re-read his book because he was familiar with the program and how in-depth some of Lamb’s questions were so he did not want to be caught off guard. 2:48 – Were you surprised by any of Brian Lamb’s questions? – None stand out from this program, however he has appeared with Lamb on other programs and his style is so direct that he always throws Pinsker for a loop with a crazy fact question which is legitimate but comes out of nowhere. 3:36 – What do you remember most from his appearance on the program? – He remembers being nervous and excited as a young history professor. Brian Lamb was very intense and intimidating. 4:09 – What do you think the benefits or drawbacks of this longer format interview for the author and for the viewer? – This was a show for serious readers and these people appreciate the extra time given to these books and topics. Interviews of this length are not common so they are precious. Anyone who reads appreciates details. 4:59 – Was this amount of preparation normal for interviewers and how did it change your interview experience? - This amount of preparation is certainly not normal. Pinkser has seen Lamb ask authors questions which showed the Lamb was more familiar with what they wrote than they were themselves. Pinsker could see the marginalia in his book when sitting next to Lamb during the interview and it was a great experience to see how much time Lamb had taken with his book and how seriously he took the subject matter. 6:37 – Were you surprised to be asked biographical questions and is this different than other interviews you have experienced? – He was a little nervous about these questions because as a young scholar he wasn’t comfortable talking about his resume. He was also asked several questions about his funding and how it affected the way he wrote the book. 7:26 – Did your experience on the show change your impression of it? – Brian Lamb seems to be one of those people who is the same on and off camera. His intensity is always there and stands out to Pinsker. 8:16 – What do you think the benefits and uses of the Booknotes Collections might be? – It is a great library of non-fiction work for a certain period of American history. He hopes that the books are annotated to go along with the interviews. 9:18 – If asked back would you have returned for another interview? – Pinsker would have come back every week. It was a great boost to his career and it was a wonderful experience. 9:43 – Was there a difference in sales or national attention for your book? – Pinsker thinks that there was but is not entirely sure. The royalties for this book went to the National Trust so he never tracked this closely. But the book sold well and he received many emails from people who had seen the program so he thinks that the interview had a good reach. 10:23 – Did your experience with Brian Lamb and Booknotes cause you to rethink any of your approaches or assumptions regarding your research or writing? – Pinsker does not think that “rethink” is the right word but he was always taught to pay attention to detail and Brian Lamb’s approach in the interview confirmed the wisdom of this approach for him. 11:08 – What have you been working on since this work and what works are you most pleased with? – Pinsker has developed a host of websites and is committed to creating digital content for K-12 teachers through Dickinson’s “House Divided” project. Through this work he has been impressed by C-SPAN’s digital archives. Pinsker sees the ways in which C-SPAN agrees with the importance of digesting and presenting scholarly information to the public. 12:28 – In your estimation what has been the lasting impact of Booknotes? – Pinsker thinks that for a certain group of people this program was like their “Oprah’s Book Club.” It represented a group of scholars who had passed on to speaking to a larger audience and not just other scholars. He thinks that Booknotes was a precursor to many of C-SPAN’s later projects, such as American History TV, and because of this it deserves a lot of credit. 13:27 – Is there anything else you would like to add? – Brian Lamb was an unexpected pioneer. Everything that he created from his “experiment in democracy” through C-SPAN has more staying power than anyone would have imagined and Lamb deserved a great deal of credit for that. Lindsey Bestebreurtje (Oral Historian), “An Interview with Matthew Pinsker.,” One Book. One Author. One Hour., accessed April 24, 2019, http://booknotes.gmu.edu/items/show/2786. 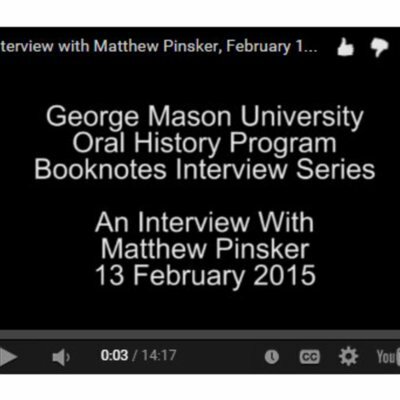 Matthew Pinsker is interviewed as part of the Booknotes Oral History Project on 13 February 2015. Mr. Pinsker discusses his appearance on C-SPAN's Booknotes program on 21 December 2003, where he discussed his book, "Lincoln's Sanctuary: Abraham Lincoln and the Soldiers' Home". Lincoln's sanctuary: : Abraham Lincoln and the Soldiers' Home"
Booknotes Oral History Series. R0143 Box 02 File 12.